"I used pMD years ago and it's so much more than a charge capture app now! Secure messaging and messaging about a patient is a whole new way to communicate with my team and referring providers." University Pediatric Associates (UPA) at Indiana University School of Medicine (IUSM) recognized that they needed a charge capture system in 1997. Already a highly successful organization, UPA wanted to streamline their billing office workflow to make their processes more efficient and effective. They knew that the excess time they spent collecting and organizing their massive volume of paper charge tickets needed to be dramatically reduced in order to shorten the reimbursement cycle and improve cash flow. UPA was able to accomplish these goals as well as realize additional clinical benefits by implementing a flexible mobile charge capture software solution. University Pediatric Associates is the faculty practice plan for the Department of Pediatrics at Indiana University School of Medicine. UPA physicians and advanced practice nurses provide services primarily at Riley Hospital for Children at IU Health but also in other locations around the state of Indiana. Riley is the only comprehensive pediatric hospital in Indiana and records more than 245,000 inpatient and outpatient visits per year. It is recognized as one of the nation’s top 50 children’s hospitals, and in 2013 ranked nationally in all 10 of the specialties that are rated by U.S. News & World Report’s. UPA physicians practice in 19 pediatric subspecialties, with over 300 providers generating more than 425,000 units of service per year. Providers see patients in inpatient, outpatient, clinic, and lab settings at multiple facilities around Indiana. Because Riley is a tertiary referral center, UPA physicians care for the sickest children in the state. The administrative burden of a paper-based billing system for hundreds of thousands of patient encounters was substantial. The providers would fill out a charge ticket for every patient encounter, selecting both CPT® codes and ICD-9 codes for each date of service. Each specialty division would gather the charge tickets and send them by courier to UPA’s billing office, located offsite. The use of dozens of different paper charge tickets in multiple specialties across so many locations resulted in a considerable charge lag. The lag time between each charge’s date of service and arrival in UPA’s office ranged from several days to several weeks, depending on the process of each division. It took an additional three to six days to compile and enter the high volume of charge tickets into the billing system. The charge entry team would process the charges, spending hours reviewing the charge tickets, tracking down missing information, and deciphering handwriting. “The work created for the billing office was tremendous,” said Mary McLean, Assistant Director of Operations. The charge tickets could be missing CPT® codes, diagnosis codes, or even dates of service. And because UPA physicians treat a wide variety of conditions within each specialty, not all of the ICD codes could fit on a one-page charge ticket. If physicians couldn’t find the appropriate diagnosis code, they might select the next best option or handwrite a diagnosis without the code. Staff would spend additional time contacting the physician to complete the billing information or obtain further information for the correct diagnosis. Physicians often had to ask clinic staff to pull the chart so they could review it, as days or weeks could have passed since the visit. The follow up might take another week or two, compounding the delay. This hurdle was slowing down the entire reimbursement process and costing UPA’s staff 15-20 hours per week, not to mention time spent on chart retrieval and review by the physician. Filing limits were always a concern with these delays, especially in Indiana where Medicaid and many managed care payers allow only 90 days to submit a claim. The added time to complete the billing data could mean the difference between full reimbursement or none at all. More critically, inaccuracies in diagnosis and CPT® code combinations cause payers to reject or deny claims entirely. Prior to implementing mobile charge capture software, UPA averaged a 13 percent denial rate, 4 percent of which was due to coding issues. Once all of the charges were keyed into the billing system, the charge tickets were scanned for record keeping and then shredded by an outside service, all of which added to the cost of managing a paper system. The charge tickets were reviewed and updated twice annually to accommodate changes to ICD and CPT® codes. Between inpatient, outpatient, labs, and procedures for each specialty, there were 64 charge tickets in all that needed to be reviewed and edited by a certified coder. This process was expensive and time-consuming, requiring several rounds of communication between UPA and the various divisions. Once they agreed on which codes to add, change, or delete, the new charge tickets were mocked up by a printing service for final approval and then printed and couriered to the sections. Overall, UPA estimates that they were spending $100,000 a year on updating, printing, handling, and maintaining the paper charge tickets. “Even though ICD-10 was years away when we began this process, we knew we had to act quickly to find and fully implement an electronic charge capture solution across the department, well before starting the ICD-10 conversion,” said Helen Brody, the administrator of UPA. “As pediatric subspecialists at an academic medical center, we utilize a wide variety of codes, even within each specialty. It would be impossible to manage paper charge tickets with such a massive increase in the number of codes.” The transition from ICD-9 to ICD-10 was going to magnify any existing deficiencies in the paper billing system and was another pressing reason UPA was determined to find an electronic charge capture solution. Given the myriad ways that providers were submitting charges, UPA knew that they had to find a system to standardize the charge capture process and still accommodate each specialty’s unique workflow. They were looking for a system that was easy to use even for the least tech-savvy provider, provided flexibility in set up, and offered thorough implementation, training, and ongoing support. They understood, though, that 100 percent physician acceptance was the most critical aspect of any electronic tool. “Decreased lag time and fewer rejections are important, but if the doctors didn’t like the charge capture program, they simply wouldn’t use it,” said Barbara Bills, Director of System Support. UPA originally began looking for an electronic charge capture vendor in 1997. They researched several different charge capture solutions, and even tried to pilot an implementation with a well-known vendor whose product seemed to be the best available at that time. They worked with another department at IUSM to test the capabilities of the product. Given the complex nature and variety of workflows within the organization, UPA required that the program be flexible enough to accommodate varying processes in each of their sections. UPA managers spent 10 to 15 hours per week for nearly two years, working with the vendor to customize the program to meet their physicians’ needs prior to the pilot. “Ultimately, we realized that not only did the product fall short, but the vendor was unable to provide the customer service necessary for a successful implementation,” said McLean. Frustration with the product and lack of support led UPA to discontinue the pilot and renew its search for a program that would be flexible enough for their complex workflow and that had the customer support crucial to a successful implementation. UPA discovered pMD in Apple’s App Store and contacted the company to learn more. After calls, webinars, and a face-to-face meeting, they went on a site visit to a pMD customer to see the software in action. Given their previous experience, the team at UPA was skeptical about how easy the pMD implementation would be. “The reviews we heard were glowing, but we just weren’t sure we would have the same experience,” Bills said. However, after extensive due diligence and finding widespread satisfaction among pMD’s customers, UPA made the decision to sign with pMD. Their physicians went live with pMD in May 2011, just two months after signing the contract. The implementation took a fraction of the time spent trying to work with the previous vendor, and UPA’s managers found that the pMD implementation was easier than any other software implementation they had done. UPA began the pilot with their critical care physicians, as they have a very high inpatient volume and would provide an excellent pressure test of pMD’s capabilities. Both the physicians and the billing office were pleasantly surprised with the rapid rate of physician adoption. “Physician acceptance is by far the biggest benefit of pMD. Our doctors absolutely love pMD, primarily because the software is easy to use.” Bills said. pMD was able to help streamline the billing process immediately. Rather than a long paper trail that began with the clinic staff and passed through many hands before reaching the billing office, the physicians are now able to submit their charges easily and quickly at the point of care. They save time that was previously spent filling out paper charge tickets and have additional visibility into their patient census, a big benefit for pediatric hospitalist Dr. Emily Webber. “As a large group rounding at multiple sites, it has greatly increased our transparency. I like being able to keep tabs on the census regardless of where I am,” said Dr. Webber. By removing the burden of compiling, copying, and sending charges to the billing office, pMD also helps reduce the workload on the departmental administrators and staff. Submitted charges are instantly accessible by UPA’s billing office, allowing the review process to begin immediately. Because all of the charges submitted in pMD require all of the necessary pieces of information, incomplete charges are no longer an issue. If questions do arise, the billing team is able to contact physicians in a timely manner while the encounter is still fresh in their minds. UPA management has found the ability to interact with the physicians in pMD to be a significant efficiency gain. “We can now communicate directly with the doctor on the charge in question and they can respond back to us right away. It has proven to be far more effective than email correspondence which may take several days,” said Bills. pMD allows physicians to easily search for and select from a wide range of descriptions of diagnosis and procedure codes for their specialty. This has helped to increase the specificity and accuracy of charges submitted for billing. Having access to a robust list of codes is particularly important in a highly sub-specialized practice. In addition to making the codes more accessible, pMD also allows the physicians to receive rapid feedback on their coding. “pMD gave the physicians an easy avenue to ask coding questions that they previously had not been asking,” said McLean. While it was difficult to identify trends using a paper billing system, pMD allows UPA to analyze their coding across all sections and improve billing. The physicians are also able to utilize pMD to analyze patient data. “We’ve been able to use reports from pMD to identify and target clinical issues. If we can identify patterns in length of stay, we can provide better care for our patients,” said Dr. Webber. As pMD was implemented in the critical care units, the physicians began asking whether additional patient handoff capability could be developed to help communicate more detailed patient information between physicians at shift change. Although pMD already included a patient handoff field, these physicians treat a high volume of very sick children, so communication of detailed data for each organ system is crucial for quality, safety, and continuity of care. Previously, they were using a home-grown database system that did not integrate with billing to log patient status updates and treatment plans. They needed a seamless way to communicate about their patients between shifts and from any location that would ensure that they didn’t miss a review of any systems that would supplement their handoff discussions and establish a central location for information. They wanted it to be integrated into the charge capture system so the physicians could navigate between the tasks with ease, while maintaining security of protected health information (PHI). Software developers from pMD worked closely with the doctors to design and customize an electronic summary with data fields that were relevant to their group. This allows the physicians to continually monitor, track, and communicate about patient status for each organ system. Dr. Mara Nitu, Chief of Pediatric Critical Care, played a key role in making the project a success. “pMD has given us a much more efficient form of communication from physician to physician that translates to better patient care,” she said. By having everything in one place, the doctors are able to submit their billing and work on their patient plans at the same time. “It’s saved us a tremendous amount of time, and now we have everything that we need at the point of patient care in one program,” Dr. Nitu said. UPA’s goals in implementing pMD were to find a product that physicians liked using, streamline their charge capture process, reduce charge lag, increase coding accuracy, and decrease the amount of payer rejections and denials. They’ve been able to accomplish each of those goals beyond their expectations, as well as realize other benefits for both the business office and the physicians. pMD has helped to shorten the reimbursement cycle and improve cash flow with real-time billing. Charge lag has decreased by 98 percent from an average of two weeks to 0.2 days across all sections. By significantly reducing incomplete or missing charges, UPA has reallocated half of a full-time employee’s time. 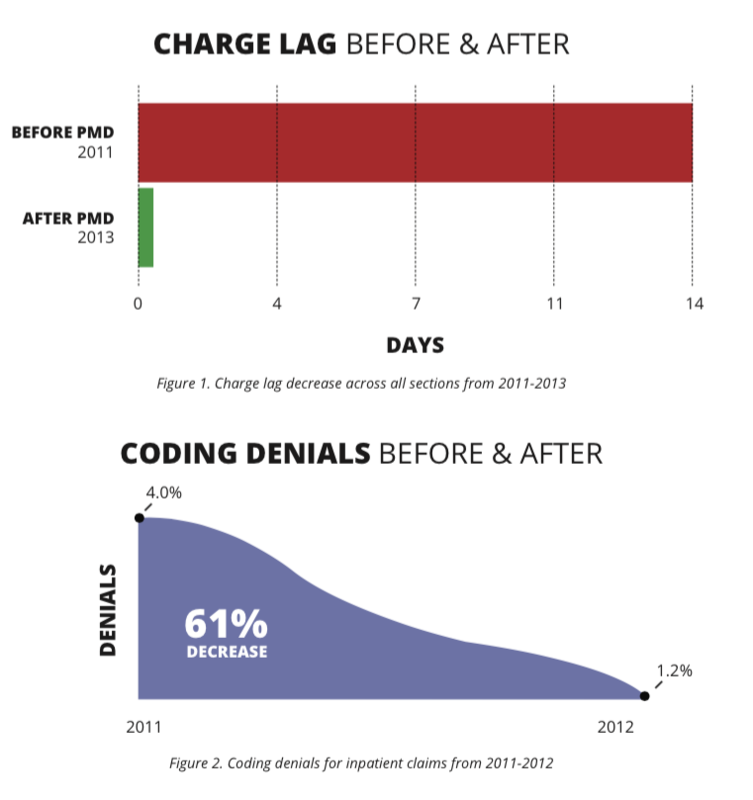 Improved accuracy of diagnoses recorded on charges has led to a substantial decrease of coding denials. UPA experienced an 80 percent decrease in denials for outpatient claims and a 61 percent decrease for inpatient claims. Although some denials and rejections inevitably still occur, the shortened charge lag has allowed for more time to efficiently correct and resubmit claims. UPA also expanded their usage of pMD beyond the inpatient setting to the outpatient and clinic settings. “The physicians were requesting pMD for outpatient billing faster than we could keep up,” said Bills. Once the decision was made to utilize pMD in the outpatient clinics, pMD was able to work quickly to get all of the sections set up and the physicians trained. pMD’s mobile charge capture software supports physicians across multiple specialties by allowing them to enter their patient charges into Android, iPhone, iPad, iPad Mini, and iPod Touch devices, and the web at the point of patient care. The patient visit is then visible to other doctors within the practice and can be billed immediately. Doctors using charge capture are increasing their ROI in a time when Medicare cuts, ICD-10, PQRS, and other costs are significantly impacting profitability. pMD increases efficiency and security in a practice through automation and HIPAA compliant secure text messaging, and it provides free interfaces with electronic medical records, hospital information, and medical billing systems, including Allscripts Pro PM, Allscripts Tiger, athenaCollector by athenahealth, Cerner, eClinicalWorks, Epic, GE Centricity (formerly Millbrook and IDX), MEDITECH, NextGen, and Vitera Intergy (Sage). For more information, contact pMD.